Apple’s share of the tablet market in Canada dropped for the third consecutive quarter, as consumers turned to smaller, more affordable options in the marketplace including brands like Playbook, Asus and Acer. According to SRG’s quarterly Digital Life Canada study, the iPad accounted for 56% of the tablets in Canadian homes in Q1 2012 compared to Q2 2011 when it had over 80% of the tablet market. Given iPad sales continue to be robust, Apple’s shrinking market share can be attributed in part to a fast-growing category with more product variety. But there is also clearly an appetite for devices with smaller-screen sizes that allow for more portability than the iPad, not to mention at a significantly lower price point. Research in Motion’s Playbook increased its share to 19% while Acer and Asus accounted for 6% and 5% respectively. No wonder, if media reports are to be believed, Apple is in the process of making a smaller version of the iPad. Even as the screen sizes get smaller, and the size of screens for smartphones get larger, the Digital Life Canada study shows Canadians use their tablets differently than their smartphones and, more often than not, predominantly in the comfort of their homes. While many Canadians take their smartphone with them almost everywhere they go, the study found on average Canadians only took their tablet with them only 28% of the time when leaving the house. Canadians who have both devices also have different apps for their tablet than they do their smartphone. 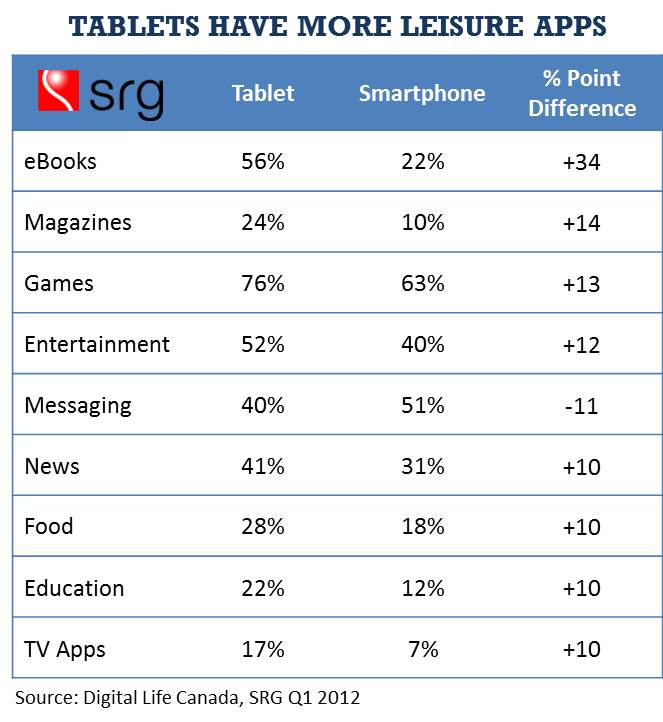 Respondents were more likely, for instance, to have apps on their tablets in the category of ebooks (56% versus 22%), entertainment (52% versus 40%) and games (76% versus 63%) than their smartphone. In fact, in only two areas were Canadians more likely to have an app on their smartphone than their tablet: messaging, and shopping. Technical: The results are based on a survey of 1,000 Canadian consumers conducted in spring 2012 as part of SRG’s quarterly Digital Life Canada tracking study.